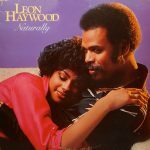 Naturally is the tenth album by Leon Haywood, released in 1980 on 20th Century. Otha Leon Haywood (February 11, 1942 – April 5, 2016) was an American funk and soul singer, songwriter, and record producer. He is best known for his 1975 hit single “I Want’a Do Something Freaky to You”, which has been much sampled by Dr. Dre and others.